The opening of Irvington House is one of many things Butler accomplished in 2018. Collegian file photo. Butler’s 2018-2019 academic year brought acquisitions, acceptances and awards. The 1,336 students of the Class of 2022 shattered enrollment numbers, and many of them are now living in the brand-new Irvington House. In September, Butler celebrated its pedestal placement by U.S. News & World Report, which named our beloved institution best Midwest Regional college. Ope! Here are the top five highlights from this semester, in no particular order. 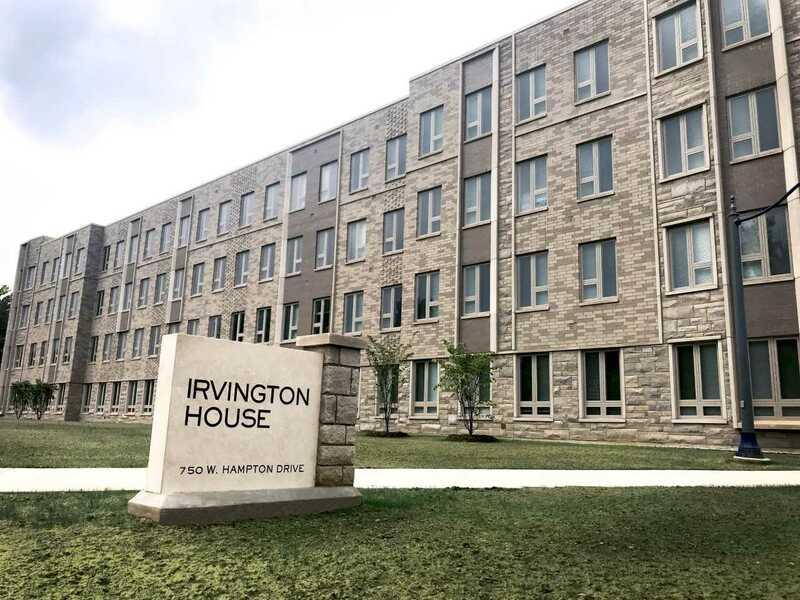 Irvington House: In August, hundreds of first-years hauled their mini-fridges and string lights through the gleaming doors of Irvington House, Butler’s spanking-new dormitory. The monolith includes an indoor bike track, fire pits, and game rooms, to the bemusement of upperclassmen. Designed by American Campus Communities, the building might be easily mistaken for a swanky hotel– which, of course, delights the parents of 2022. Butler’s Sept. 13th ribbon-cutting ceremony celebrated Irvington’s completion. Butler welcomes record-breaking class: The Class of 2022 is Butler’s largest class with 1,337 first-year students. The class demographic is 60 percent non-Hoosiers, and 16.9 percent multicultural students. Butler also received a record-breaking amount of applications: 16,431. If this upward trend continues, let’s hope Butler makes responsible decisions balancing faculty ratio and allocating classroom space. We could also use another Starbucks. Butler ranks No. 1 for Midwest Regional University: For the first time in school history, Butler was named #1 Midwest Regional University by U.S. News & World Report in September. In the 32nd annual report of best colleges, Butler tied with Creighton University for first place. You’d think our men’s basketball team would’ve pushed us past the Bluejays. In addition, Butler earned the No. 1 spot for most innovative school among Midwest Regional Universities for the fourth consecutive year. Ross Hall soldiers on: In November, Butler administration announced that Ross Hall will remain open for the 2019-20 academic year. This decision was made to accommodate increasing enrollment projections. Ross Hall has been a bastion of Butler’s campus since 1954. Ross Hall’s future beyond 2020 is unknown, but rest assured a fresh crop of first-years will occupy its sweltering halls come August 2019. College of Education moves to South Campus: Butler finalized their purchase of Christian Theological Seminary, now referred to as South Campus. The College of Education left their dark lair in Jordan’s basement, and flew South, where they began classes in the refurbished building this semester. This should ease the growing claustrophobia brewing in Jordan Hall — unless, of course, the Class of 2023 keeps us bursting at the seams.